We enter into the Fixed Water sign Scorpio, the 8th sign of the zodiacal year. The zodiac which we use was established by the Chaldeans in ancient Mesopotamia. The ancient Babylonian priest-astronomers who mapped the constellations and laid the foundation for modern Western Astrology used the celestial signs as omens for divination. What they were doing was using scientific observation and analysis to record periodic events. In other words, they realized that what was happening in the sky had a pattern to it. They tracked the movement of the planets and used them to “predict” seasonal changes, weather patterns and other cyclical occurances. Scorpio is a sign which shows three forms. That is why you see it as an eagle on the Wheel of Fortune and the World card. It is represented by the Scorpion in its lower form, by the Golden Eagle in its evolved form, and by the Phoenix in its exalted form. Animals can be symbols, and they show up in dreams and visions and meditations. When they appear symbolically, they may be totems teaching a specific lesson. Often times, the lesson of an animal can be identified by simple examination of the animal’s characteristic behaviors. You can derive much more meaning from studying the traits of an animal and coming to your own conclusion than by just looking up “what does this animal mean?” It is almost always subjective. The scorpion is nocturnal. It burrows. This leads to its association with seeking that which is hidden, the occult and the esoteric. It is easily identified, and in a black light it glows phosphorescent – perhaps lending to its mystery and magic. When hunting its prey, if the Scorpion’s crushing pincers don’t kill, its venomous sting will. This is common knowledge, and is somewhat fear inducing. Yet there is a fascinating and less known fact of the Scorpion which we can use to understand this time that we are entering. During its lifetime, the Scorpion will molt 5-7 times. Its hard exoskeleton cracking open, it emerges from this shell a soft, white, flexible new version of itself. Can you imagine? Breaking down the center, it pulls out its claws, then slowly pulls its entire body from its casing. It is at this point that the scorpion is at its most vulnerable. It is not hard to see why the Scorpio has an evolving form. It is an animal that literally is reborn multiple times, and each time, the very thing that protects it, can no longer house it. The old hardened protection is outgrown, and must be discarded. Now we can see why the rebirth process is not just a walk in the park. The number 13 and Death might seem like appropriate associations for the sign that arcs across Halloween, but remember this holiday has its roots in the ancient Celtic festival Samhain (Sah-win), which marks Summer’s end and the entrance of Winter – the Death part of the cycle. The image of death is often seen as a sythe-wielding skeleton or a Saturnian evocation of the Grim Reaper. Death yields to none, and its message is simple – that which is done is done. Death speaks calmly: “Do not try to fight me, you will not win.” Death eventually falls upon all living things – king and poor alike. It is a natural part of life. Every candle burns out. Every book has its final chapter. 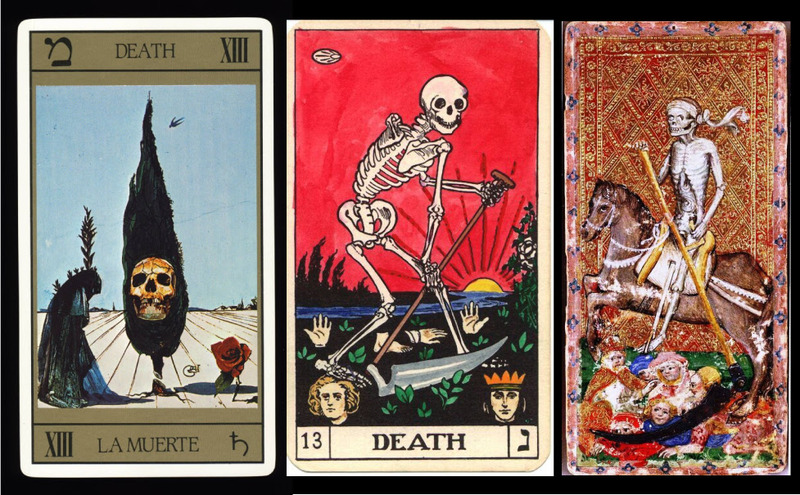 There is a joke among Tarot Readers, that if it is your first tarot reading, you will always draw the Death card – a seemingly self-fulfilled prophecy derived from a fear of hearing a death prediction. Allow the cards to be interpreted for what they are: symbols, metaphors, analogies. Just as the Emperor does not represent an actual Empiric Ruler, so does Death rarely represent the death of a body, but some type of cyclical ending, and the best advice is to accept it and surrender to it. Some have claimed that Death is the Rebirth card, and I argue that it is not rebirth, yet it initiates rebirth.